At the beginning of the World Cup I set out to keep an eye out to find The Golden Mullet that would take us all on a wonderful journey across the International Bad Line and beyond. There were so many mullets on offer that you really had to be doing something special to stand out. Of course you had the classic like Argentine fullback Juan Sorin. But this was common and had been done so many times before. 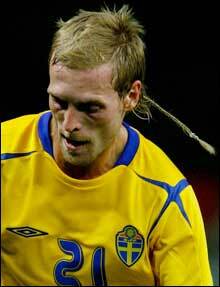 Swedish midfielder Wilhelmson came with something never seen before - his own interpretation of the part mullet/part rattail/ part single dread, earning himself an honorable mention for originality. 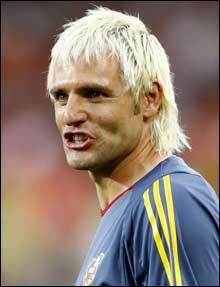 Spanish backup goalkeeper Canizares was sporting a crazy dye-blond mullet that made him look like he was straight out of an 80s metal glam band, earning himself an honorable metion as well. Laid down a wicked bassline on "Dr. Feelgood" "Unskinny Bop"
All solid efforts. 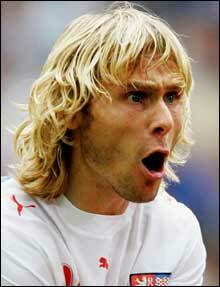 But there can only be one Golden Mullet, and that prestigous honor is reserved for midfielder Jan Polak of the Czech Republic. 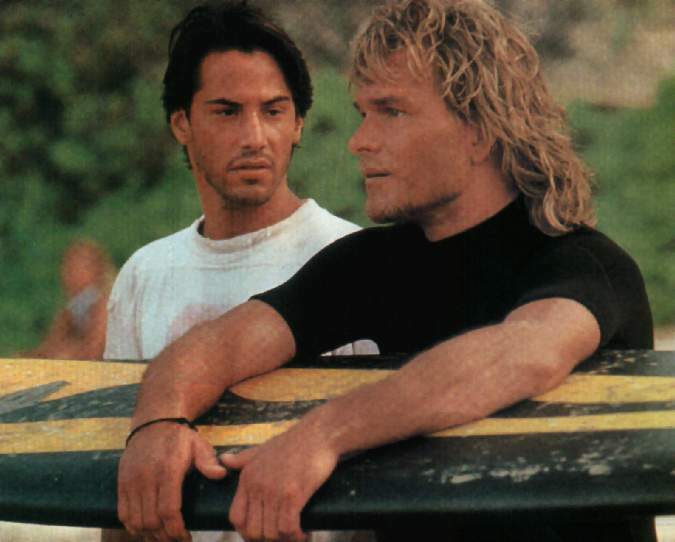 On a squad already boasting Patrick Swayze from Point Break, you really have to come strong to get any notice, and come strong he did. He not only went for the shaved sides look, the rooster mohawk on top, AND the blond dye on the mullet proper leaving a skunky two-tone effect, but he took the extra step of seperating the top and the back into their own sections. Ghana's gladiator Essien, running scared. Put all that together and you have your winner. I am proud to bestow this honor upon our hero Jan. It should go someway towards offsetting all of the dumb Polack jokes about him not being able to spell his name correctly or even suit up for the correct country. ...and then red. 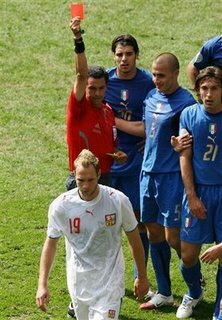 The referee was clearly a hater, and Andrea Pirlo (21 in blue) is clearly in awe. Speaking of 80s glam metal bands, the team award went to Ukraine, hands down. Argentina were pretty good, but in the end they could not touch this Ukranian team. I am pretty sure that I saw them open up for Skid Row back in 89.
and a few of the subs in action then you know. A nomination for team award, classic division was put in for Bulgaria 1994, particularly this dude. I honestly didn't have or take the time to do any legwork and come up with any challengers, and I just met a cute girl from Bulgaria, so there's your winner. Finally we have the most fucked up haircut, mullets excluded. There were so many solid entries that it is a bit of a suprise that we had such a runaway winner. 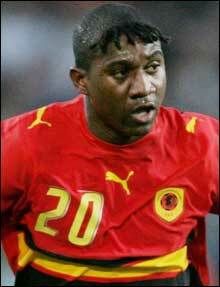 Our man plays defense for Angola and is named simply Loco, which serves not only as his name but as a one-word explanation of his unbelieveable haircut, which is basically 2002 Ronaldo meets Dreadlock Rasta. So awfully horrid that is absolutely rules. 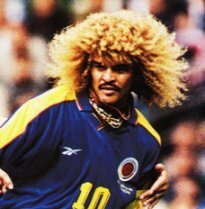 Sadly, there was no competition for most fucked up haircut, classic division, and there never will be, because nothing can ever top the full on insanity of Carlos Valderrama (my God, take your pick). Ever. He will hold this title ad infinitum. The one and only MFUHCCD. "Laid down a wicked bassline on "Dr. Feelgood"
Not to nitpick but really that should say, "Laid down a wicked solo on "Unskinny Bop". The resemblance to C.C. Deville is uncanny. Dave- Thank you for succeeding where my co-workers all failed today when I asked them: "hey - this dude looks EXACTLY like one of the guys from one of those 80s metal glam bands, but it's not motley crue. Who is it? ", and they all failed miserably. Correction coming and a tip of the hat to you my man. I'm impressed that you actually got a picture of the elusive Wilhemsen rat-tail -- I tried to track one down during the cup and it was plainly not just small nut elusive.